Artists' Health Insurance Resource Center Since 1998, AHIRC has helped artists everywhere get affordable, quality health insurance and health care. Created by The Actors Fund with a grant from The National Endowment for the Arts, AHIRC hosts a carefully-researched, constantly-updated database of information about access to health care and insurance. AHIRC also offers in-person counseling, national telephone support, and Getting and Keeping Health Insurance workshops offered at arts, cultural and human services organizations throughout the country. Future of Music Coalition's Health Insurance Navigation Tool Since 2005, FMC's HINT program has offered personalized advice to musicians about their health care options, for free. HeadCount is a non-partisan organization that works with musicians to promote participation in democracy. HeadCount has been collecting health care stories from notable musicians, and has set up a health insurance hotline (1-919-264-0418) to help musicians and their managers navigate these changes. They also have resource kits available to the press. Health Alliance for Austin Musicians HAAM provides access to affordable health care for Austin, TX's low-income, uninsured working musicians, with a focus on prevention and wellness. HAAM's website includes helpful links for Texas-based musicians and artists. MusiCares Established by the Recording Academy in 1989, MusiCares provides a safety net of critical assistance for music people in times of need. O+ Festival The O+ Festival is a three-day, community-run celebration of music, arts and wellness. This year's events are happening in Kingston, NY and San Francisco, CA. O+ participating artists exchange their contributions for health and wellness services from art-loving doctors, dentists, and other medical providers at the O+ Pop-up Clinic during the festival. Southern Arizona Artist and Musicians Healthcare Alliance (SAAMHA) is a non-profit organization offering emergency medical relief awards for artists and musicians in the City of Tucson, Pima County, Cochise County and Santa Cruz County, Arizona. The SAAMHA website includes a list of regional resources for artists. Young Invincibles is a national organization committed to mobilizing and expanding opportunities for young adults between 18 and 34. They are currently running a Healthy Young America video campaign and contest to educate young people about affordable healthcare options, and have built a free Healthy Young America app for smartphones that helps users discover health care options and find local health care services. Healthcare.gov is the federal government's primary portal for information relating to the Affordable Care Act. Well-designed, it includes answers to many common questions, and details about how the rollout will happen in your state. Get Covered America is a project of the nonpartisan 501(c)(3) organization Enroll America, whose mission is to maximize the number of uninsured Americans who enroll in health coverage made available by the Affordable Care Act. The website includes lots of helpful information. Do you have other questions? Email us at healthcare@headcount.org or call our artist-friendly hotline at 1-919-264-0418. 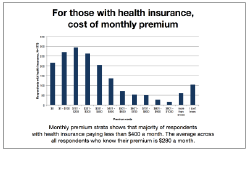 Kaiser Family Foundation's brief video overview of the pieces of the Affordable Care Act. 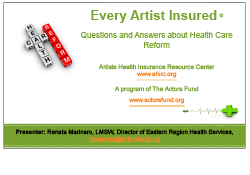 AHIRC's excellent and thorough overview of the Affordable Care and and steps artists can take to find health care. Data from a recent survey of US-based musicians and artists about their health care coverage. A Pittsburgh-based artist collective describes the challenges artists face regarding health care and insurance.